Your Career Training USA acceptance package includes important information and documents you will need to apply for your J-1 Visa and to prepare for your stay in the U.S. Please keep them safe and in your possession at all times. Make photocopies of all documents and keep them in your carry-on luggage when traveling to the U.S. 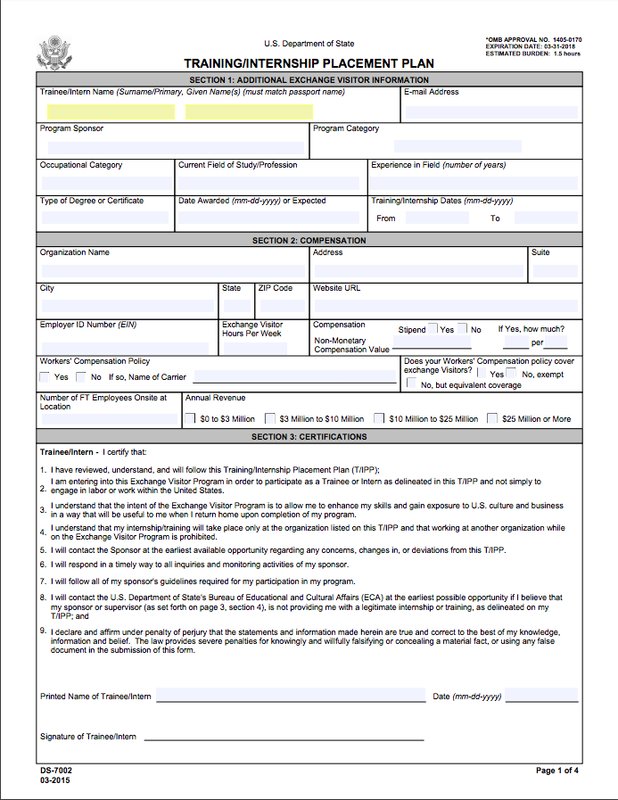 The DS-7002 Form is a U.S. government document that includes a description of your internship or training program. Before you were approved for sponsorship, you should have had time to review your plan and agree to the terms and objectives outlined in the plan. However, if anything needs to be changed, please discuss the changes with InterExchange and your host employer immediately. If your training plan is accurate, check your DS-7002 to ensure that it has been signed by InterExchange, your host employer, and yourself before your J-1 Visa appointment. The embassy or consulate may keep your DS-7002 Form for their files, so please remember to make a copy for yourself. 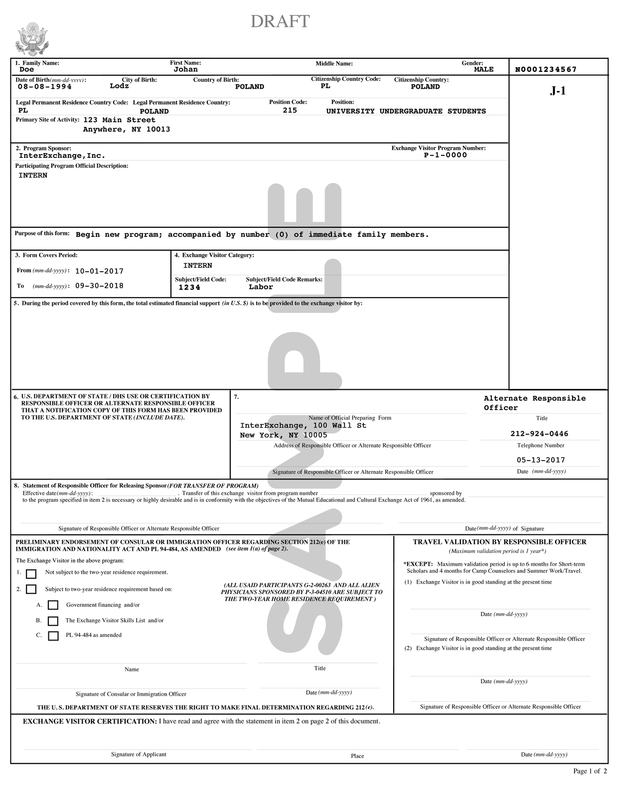 The DS-2019 Form is a U.S. government document that allows you to intern or train with a U.S. company. Serves as proof of sponsorship for your J-1 Visa. Identifies InterExchange as your program sponsor. Describes the purpose of the program. States the time period that you are legally permitted to intern/train in the U.S.
You are only permitted to intern or train with a valid DS-2019 Form and only during the dates listed in Section 3 of your form. Although you may only intern or train within these dates, you may enter the U.S. up to 30 days prior to your program begin date. You may legally remain up to 30 days after your program end date, unless otherwise specified. The J-1 Visa is a sticker added to your passport by a U.S. Embassy or Consulate in your home country. The J-1 Visa allows you to enter the U.S. when you present it with your DS-2019 Form at U.S. Customs & Border Protection upon arrival. You cannot obtain a J-1 Visa stamp within the U.S; it must be obtained in your home country. 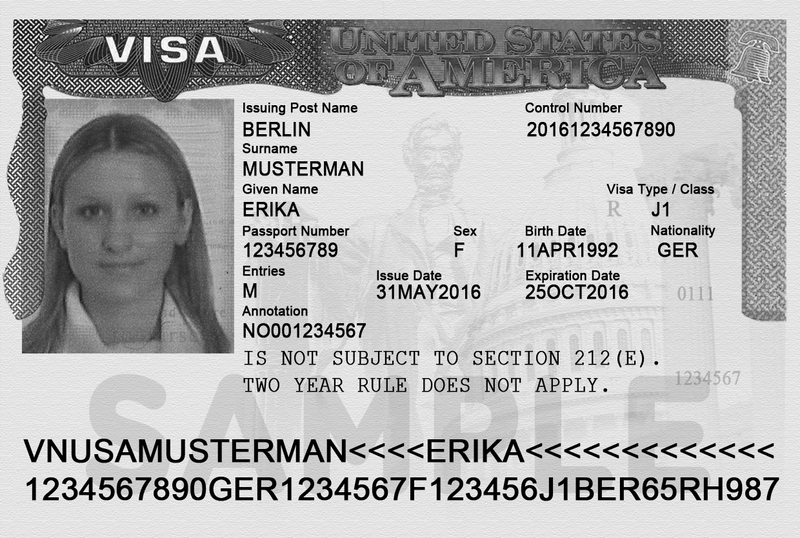 It is generally valid for one, two or multiple entries into the U.S., and it has an expiration date, which may or may not be the same as your program end date. Intern/Train in the U.S. during the dates listed on your DS-2019 Form for the host employer approved by InterExchange Career Training USA. Apply for a Social Security number. Perform unskilled labor or provide patient or child care. Extend your work eligibility or program participation past 12 months for interns or hospitality trainees or past 18 months for all other trainees. Intern/train for more than one host employer at the same time or obtain a second job. Intern/train for fewer than 32 hours a week or perform more than 20 percent clerical work. The J-1 Visa allows you to enter the U.S. The expiration date on your J-1 Visa is the last day you may enter the U.S., not the last day you can intern/train. If your visa expires before the program end date listed on your DS-2019 Form - which is a possibility if you extend your program - and you plan to leave the U.S. for vacation after your visa expires, you will not be able to re-enter the U.S. without a new visa. You will need to apply for the new visa at a U.S. embassy or consulate abroad before returning to the United States. Be sure that you know the expiration date of your J-1 Visa and plan your international travel accordingly.